Paul Pogba remains a Manchester United player after a turbulent summer, but it seems as though Barcelona have only just begun their pursuit of the World Cup winner. Pogba enjoyed the best summer of his career to date with France at the World Cup in Russia, where he played a key role as Didier Deschamps men lifted the trophy after a 4-2 final victory against Croatia. The 25-year-old even scored in the showpiece event, which capped a fine individual tournament for the Frenchman during which he finally lived up to his immense potential. At club level, however, it has not been all plain sailing for Pogba over the last couple of years. Since returning to Old Trafford from Juventus for his second spell at the club in 2016, the French star has struggled to consistently produce the goods, only sporadically displaying the superb skill and vision which make him one of the most talented midfielders of his generation. Much has been made of his reportedly prickly relationship with current manager Jose Mourinho, who has publicly called him out for his below-par displays on several occasions – as per the Mirror. 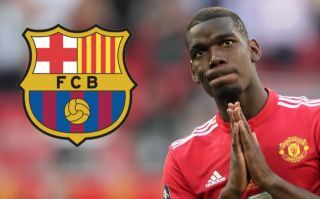 As a result, speculation linking Pogba with a move away from Man United has been rife over the last few months, with La Liga champions Barcelona reportedly relentlessly pursuing a deal to bring him to the Camp Nou, as the Independent reports. According to the Independent, the Catalan giants are willing to play the long game to capture the former Juventus man, in a similar vein to how they ultimately managed to lure Philippe Coutinho to the club from Liverpool back in January. Coutinho had been heavily linked with a move to Barca during last summer’s transfer window, but when a deal couldn’t be arranged initially, the Blaugrana came back to secure his signature just after Christmas instead. Player power might additionally be a significant factor in turning Pogba’s head, with Barcelona centre-back Gerard Pique already coming out publicly to welcome the prospect of signing the Frenchman, stating that the club is always in the market for ‘the best players’ in world football – as per BBC Sport. As Goal reports, Luis Suarez has also added fuel to the fire by suggesting that Pogba is driven by the desire to win as many trophies as possible, which the Uruguayan forward implies would be more likely at the Camp Nou than at Old Trafford. Such underhand tactics have been a feature of Barcelona’s recent tactics in the transfer market and with a track record of successfully acquiring the targets they identify over the last few years, it is highly likely that this particular saga will rumble on into January. Red Devils supporters will be desperate to keep hold of their midfield talisman, who despite his flaws is probably the best player at the club on his day and vital to the team’s chances of challenging for silverware this season and beyond. In the meantime Barcelona seem to be waiting in the wings, ready to pounce when the next opportunity arises.